November 16 to November 29 in the Appearance category in both Reboot and non-Reboot worlds. Check out the Male Hairstyles available now: Mouse-boy Hair (NEW! ), Spiky Mess Hair (NEW! ), Artist Hair, Super Antenna, Sharp Cut, and Crayon Hair. Check out the Female Hairstyles available now: Pudding Hair (NEW! ), Pie Hair (NEW! ), Cute Tied Bun Hair, Ultra Bangs, Spiral Curl Hair, and Siren Hair. Check out the Male Face Styles available now: Mouse-boy Face (NEW! ), Cartoon Face, Dylan Face, Moonlight Eyes, Hoi Poi Face, and Caterpillar Brow Face. Check out the Female Face Styles available now: Pudding Face (NEW! ), Pie Face (NEW! ), Rosalia Face (NEW! ), Sleepy Face, Jewel Eyes, and Beryl Face. November 16 to November 29 in the Special Promotions > Limited Time category in both Reboot and non-Reboot worlds. Do you need a fun chair for when you’re hanging out in Maple World? Use the Chair Gachapon Ticket, guaranteed to give you one amazing chair! Spend time in a beautiful place with Mermaid's Coral Reef Runner, Octopus Fish Tank Chair, Butterfly Love Flower Chair, and Crystal Memories Chair. Take a trip on the Electric Car Cable Chair, Hinakazari Chair, Red Lantern Chair, and Flying Carpet Chair. Go outdoors with the Forest Sanctuary Chair, Royal Azalea Chair, Sparkling Maple Chair, and Welsh Corgi Chair. Be a kid again with the Baby Cradle Chair, Toilet Duck Chair, Pink Teddy Chair, and Moon Light Angel Chair. And pick up the Chocolate Fondue Chair (sit on the chair near another player to see an effect appear), Bookshelf Chair, Celebrity Chef Chair, and Maple TV Chair. November 16 to November 29 in the Special Promotions > Limited Time category in non-Reboot worlds only. Get prepared for Black Friday! 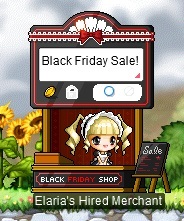 Set up this store on the Free Market and the shop will sell items for you, even while you are logged out. November 19 to November 20 in the Special Promotions > Limited Time category in non-Reboot worlds only. On November 19 and 20, we will be having a special deal on 8-Slot Inventory Expansion Slots! Get ready to expand your inventory! You have until 11:59 PM Pacific on November 20 (2:59 AM Eastern / 7:59 AM UTC on November 21) to purchase these items at a discount! November 19 to November 20 in the Special Promotions > Discounted category in both Reboot and non-Reboot worlds. On November 19 and 20, we will be having a special deal on Safety Gems, Respawn Passes, and Buff Freezers! Stock up on these items to protect yourself from accidental death! If you have a Safety Gem in your possession when you die, you will not lose any EXP! Once you are revived, you will also recover 30% of your HP and MP (based on your HP/MP before any buffs, item equips, or other modifications). You can use this item repeatedly until it expires. If you have a Respawn Pass in your possession when you die, you’ll be brought back to your current map once you revive. Save yourself the time of walking back from town. You can use this item repeatedly until it expires. If you have a Buff Freezer in your possession when you die, you will be able to carry over most of the buffs you had when you revive! You will be asked if you want to use the item before you revive. You have until 11:59 PM Pacific on November 20 (2:59 AM Eastern / 7:59 AM UTC on November 21) to purchase these items at a discount! These items sell for NX in non-Reboot worlds only, and sell for mesos in Reboot world only. November 16 to November 22 in the Special Promotions > Limited Time category in both Reboot and non-Reboot worlds. Get your wings with this package of permanent equips! Flap along with the little blue bird weapon cover. November 16 to November 22 in the Special Promotions > Last Chance category in both Reboot and non-Reboot worlds. November 9 to November 29 in the Special Promotions > New Arrivals category in both Reboot and non-Reboot worlds. Bunny Patch Pants, Fairy Spark, Rainbow Sneakers, Pastel Dot Tee, Nagging Megaphone, Banana Overalls, Petit Ciel, Lucia Hat, Lucia Outfit, Lucia Cape, and Lucia Shoes. November 9 to November 22 in the Special Promotions > Limited Time category in non-Reboot worlds only. Take home the Chroma Bean pet by itself, or with 2 of its buddies! Chroma Bean comes with an equip to wear, yummy pet food to eat, a dye coupon, a Pet Name Tag, and some useful pet skills and scrolls. You can change the color of your Chroma Bean pet using the dye coupon included in the package. November 9 to November 22 in the Special Promotions > Limited Time category in Reboot world only. Take home the Chroma Bean pet to join you on your adventures in Reboot World! You can also get the Chroma Pink Bean Dye Coupon, and use it to change the color of your Chroma Bean pet.